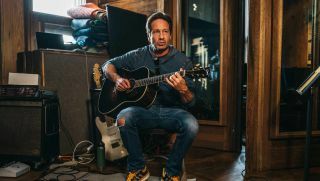 David Duchovny is not your normal rock star. For a start, he's bona fide Hollywood A-lister, with The X-Files and Californification under his belt and Golden Globes for both on the mantelpiece. He's also a novelist. In 2005 he published Holy Cow: A Modern-Day Dairy Tale, a madcap adventure about a dairy cow named Elsie Bovary who decides to move to India because she's heard that cattle are revered there. He followed this with Bucky F*cking Dent, a tragi-comedy about a man with a battery-powered fish. And he's a musician. While the usual route from successful actor to serious musician is to toss money in the direction of a favourite genre - see Jeff Goldblum (jazz) and Hugh Laurie (blues) - Duchovny's approach feels less folly and more heartfelt. For a start, he writes his own material. It's alt-rock in a Wilco vein, grown-up, adventurous songs of melancholy and introspection, sung in a voice that - while unpolished in places, as if he hasn't quite yet figured out the shape of his own sound - fits the music perfectly naturally. With two albums under his belt - 2015's Hell or Highwater was followed by last year's Every Third Thought - he's taking the show on the road, backed by New York band Weather. He'll play Manchester on February 19 and Dublin on the 20th, before wrapping up the UK leg of the tour with a show at London's Shepherd's Bush Empire on the 22nd (full dates below). Tickets are on sale now. Here, Duchovny picks 10 Records That Changed His Life. "Wild Horses to me is just such an emotional song. It's just a great marriage of feeling and melody, a perfect song with a beautiful image in the middle of it. It just works: a great lost love song, and the music just suits. And it's beautifully produced. The percussion is great, the lead guitar in the middle is great, and Jagger's vocals are great. "The words are really good, but kind of hard to understand at times, which is something I love about The Stones. You can make out half their words. Like most of these songs, it's from a time when you have a soundtrack to your life. When you're younger, songs are more important." "I was listening this morning to some Elton John this morning, and there's a few of his songs I could choose. Come Down In Time is a song that not a lot of people know. It's a beautiful song. Such a great lyric by Bernie Taupin: another song seemingly about lost love. I guess I gravitate towards those. "The marriage of Elton John and Bernie Taupin is just magical. I heard at one point that Elton would just be given the words and go and write the song. It wasn't the other way around. It wasn't like he would give Bernie the music. The lyrics are often more like poems than what we think of as lyrics. "Some of the lines are very difficult to sing, you know? Some of them are quite chunky. But Elton could somehow weave them through the melody. And I think there's a tension between the music and the lyrics because they're unknown to each other when they start. It's an amazing partnership." "This song just moves me. It could be the strength of the production, Paul McCartney's voice... all those things. And again, it's a beautiful image. "It's not an original image, but things don't have to be original in rock'n'roll. In fact, somehow, sometimes, the more cliched the better. You can't get more cliched than a long and winding road, but when you put it to that melody, and you put it with that voice and that orchestration, somehow it's just incredibly moving." "It's just a great, great love song, and Al Green is one of my favourite voices of all time. It's a simple song, and it says it all in the title. It's simply beautiful. That's pretty much all he's saying to the woman that he's singing to, and he just puts it over. It's not about the lyrics of Al Green. It's about the feeling." "It's a very dramatic song. Sometimes when I'm performing I try to think of each song as a little movie or a little story, but Baba O'Riley's like a whole movie. Even sonically, it's like two or three different songs. A great riff, a great introduction, and an amazing bit of production by Pete Townshend. "Although it's maybe the worst song titles of all time. I don't know what it means, and everyone always says they love 'Teenage Wasteland.' They don't know Baba O'Riley!" "This was a favourite of mine when I was a kid, and it's still one of the great basslines of all time. I could list my Top 10 songs and have three or four Sly songs in there. "He puts me in mind of Prince, because I think Prince got a lot from Sly. The Cross by Prince is a beautiful song. It's a very dramatic song: very simple lyrically, but potent. He's talking about The Cross, you know? It's a big effort, a big subject, and the music sounds like it." "I think Stone Temple Pilots are kinda underrated behind Nirvana and Pearl Jam and Soundgarden. They were a great band from that time, but they don't really get the respect that they deserve. Scott Weiland was a tremendous vocalist, and I think their riffs are clean strong and great." "I'm into intros - I should write more intros to my own songs. When this song kicks in... and great background vocals! Amazing background vocals. And again, lyrically, I'm not exactly sure I know what's going on, but I get the sense, and it's just a great, impressionistic portrait of a time in history when I was just a kid. "I saw the film 20 Feet From Stardom, where Merry Clayton tells the story of being asked to do the vocal. She was awakened in the middle of the night to come down and sing it, and that's the way greatness can sometimes happen. Sometimes you've got to plan for it, and sometimes it just happens. Because you're lucky. Because you're in the right place." "Since I gave The Stones two, I've got to get The Beatles two. I seem to have a lot of religious songs on my list. Very interesting! "It's just a perfect song to me. Just a perfect feeling, perfect sense of longing. It's vague enough that you're able to plug in all of one's own feelings. The kind of dance a great song does is it's both specific and vague at the same time. It leaves you room to walk in the door, you know?" "When I was 10 years old this was a song I listened to a million times, and it still feels fresh. It's still fun to sing along to, and it's still shockingly relevant."